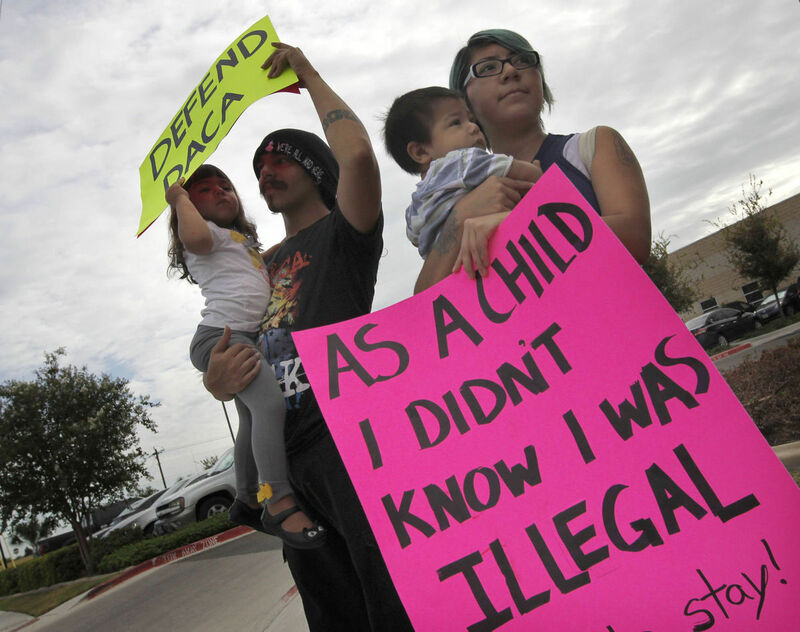 Local demonstrators hold signs outside of the Texas Attorney General's Office in Pharr September 2017. McALLEN — The deadline for recipients to re-apply to a federal program that shielded them from deportations has arrived. Despite talk in mid-September from the Department of Homeland Security’s deputy assistant attorney general that the deadline might be pushed back, it remains intact. The additional time would have afforded recipients of the Deferred Action for Childhood Arrivals more time to submit application renewals, alleviating some concern for them. Now a month since U.S. Attorney General Jeff Sessions announced the program’s rescission, many DACA recipients are left with a sense of uncertainty, and now can only hope that politicians work out a deal with President Donald Trump’s administration to replace the program that shielded nearly 800,000 undocumented people. At the forefront of the argument in favor of replacing the program is the economic damage that could result from yanking nearly 1 million people, and more than 100,000 state-wide, from the nation and state’s workforce. Salvador Contreras, an associate professor of economics and finance at the University of Texas Rio Grande Valley, said it might be difficult to gauge the regional impact because the number of DACA recipients tends to be higher in bigger cities — like San Antonio, Austin, Houston and Dallas — where the impact will be more apparent. In January, the Cato Institute released a report that showed the economic and fiscal impact of repealing DACA, the 2012 Obama-era executive order that shielded residents who entered the country illegally as children from deportation. The report cited a June 2015 national survey conducted by Tom K. Wong, of the National Immigration Law Center and Center for American Progress, in which he spoke with more than 450 DACA recipients. Contreras, who cited Wong’s survey, said the math of removing that many workers out of the state doesn’t bode well for the state economically. Contreras believes the phase-out of the program will lead people who enjoyed the benefits of higher-paying jobs — access to public universities and education from the 2012 executive order — go back to living in “the shadows,” to avoid deportation. U.S. Reps. Henry Cuellar, D-Laredo, and Filemon Vela, D-Brownsville, underscored the damage it would do to the state and the country if a large number of people were to be yanked from the workforce, stating that more than $450 billion in GDP nationally could be lost in the next 10 years. “By the president’s own description, DACA recipients are ‘good, educated and accomplished young people,’” Vela said in a prepared statement. “Pushing them back into the shadows will have a significant impact on our country’s economy to the tune of $460.3 billion in GDP loss over a decade and a cut in contributions to Medicare and Social Security of $24.6 billion over a decade. Cuellar shared similar sentiments; calling the program’s phase out a humanitarian failure, as well as an economic one.